Attention: Out of Stock ! Product is no longer available ! The TAMS 70488 is fully compliant with the PCI specifications for 3.3V and 5V PCI/PCI-X slots. The card operates with 32 bit or 64 bit signaling specified at 33, 66, 100 or 133MHz, allowing complete configuration flexibility. 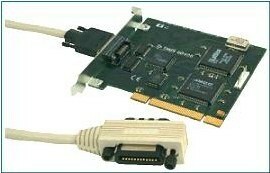 TAMS 70488 is a functional replacement for the HP/Agilent E2078A PCI GPIB Card.